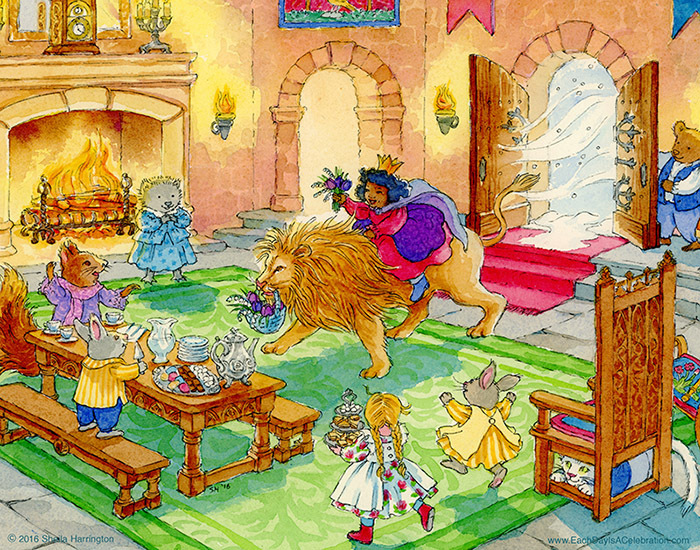 Wishing you warmth and a bouquet of late winter flowers, wherever you are. This year I’ve created a second, entirely different calendar in addition to the more “grown-up” still-life calendar. 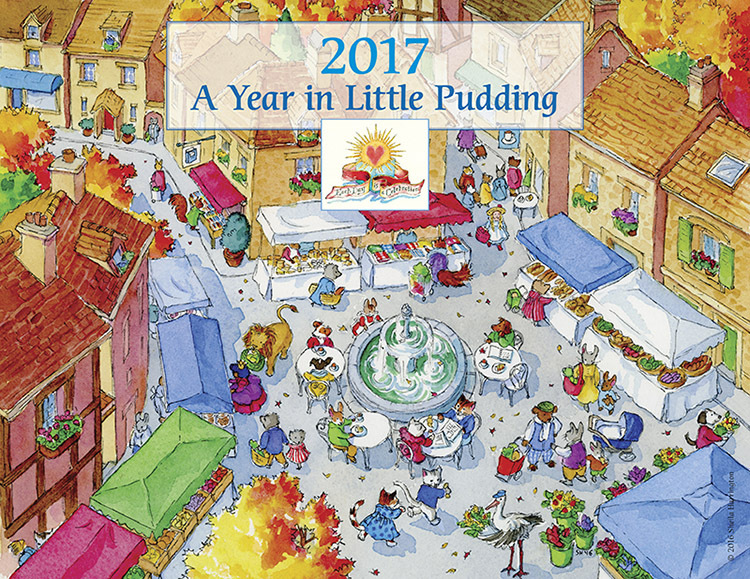 It features the inhabitants of the village of Little Pudding, about whom I’ve been inventing stories since my daughter was in kindergarten. Unless you prefer to be surprised, you can scroll down to see the twelve scenes of village life featured within. (Click twice to see the image larger.) The calendar is 8-1/2” x 11” and printed on sturdy satin stock, substantial enough so the images can be saved as prints. A single calendar is $20; a set of two is $36. Shipping is 3-day Priority Mail, domestic US. If you are in my area, you can obtain a calendar from me directly without shipping—just let me know. This is the time of year we sit down to set goals and make resolutions for improvements in health, relationships, work life, state of mind and heart, and condition of the bathroom medicine cabinet. Here is one possibility. Below are links to others. Happy New Year, everyone! 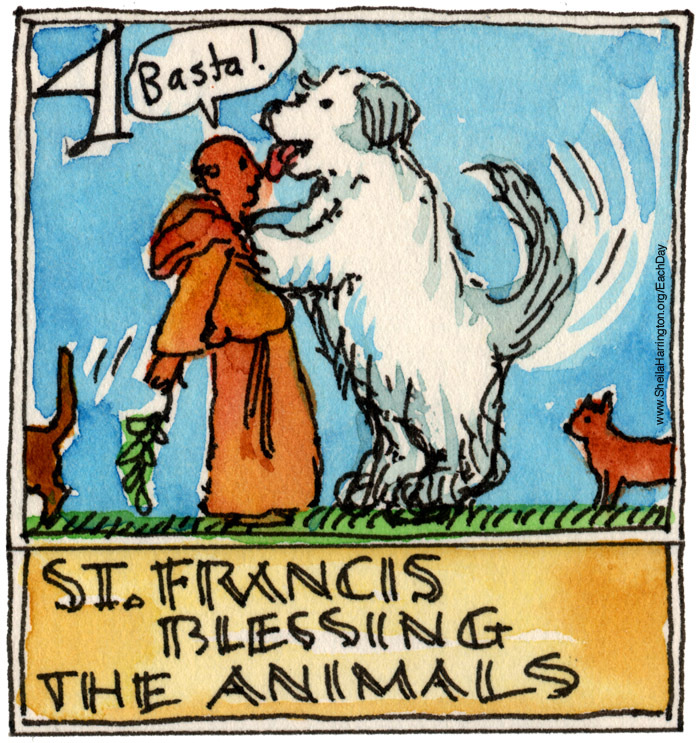 Today is the Feast of St. Francis of Assisi, and in many places this is commemorated with an annual Blessing of the Animals in local churches. 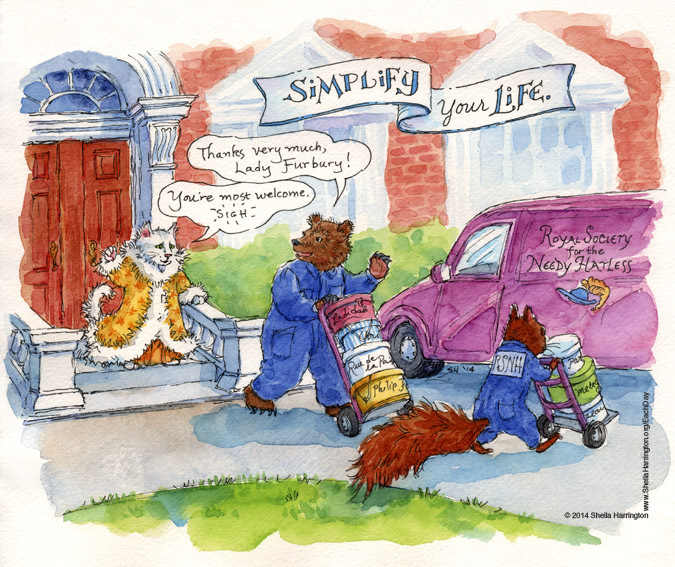 But Fluffy, Fido, and Goldie will have to wait until the weekend. Washington National Cathedral holds its ceremony on Sunday, October 7th, at 2:30 pm, on the west steps. In Woodley Park (our neighborhood) there is a choice between the front lawn of All Souls Episcopal Church on Saturday, October 6th at 3 pm, and St. Thomas Apostle at 10:30 am (where there will also be coffee and donuts for the people and treats for the animals). A Google search will undoubtedly reveal a blessing near you. Today is also the birthday of writer and humorist Roy Blount, Jr., author of several books suitable for this day (as well as many other books on a wide variety of subjects): I Am Puppy, Hear Me Yap: The Ages of Dog; I Am the Cat, Don’t Forget That: Feline Expressions; Am I Pig Enough for You Yet? : Voices of the Barnyard; and If Only You Knew How Much I Smell You: True Portraits of Dogs. He is also a contributor to Unleashed: Poems by Writers’ Dogs, a gift for anyone who loves both dogs and poetry. For a sketch, a riddle, and a mini-bio of Blount, please see Language Lover. Julia McWilliams Child (1912-2004) would probably be horrified at the departure from classic cuisine depicted herein, but I post it in a spirit of unequivocal admiration for her blend of the classic and the unconventional that made her both compelling and beloved. Today is the birthday of the woman who probably did more than any other individual to open the eyes and broaden the palates of American cooks. 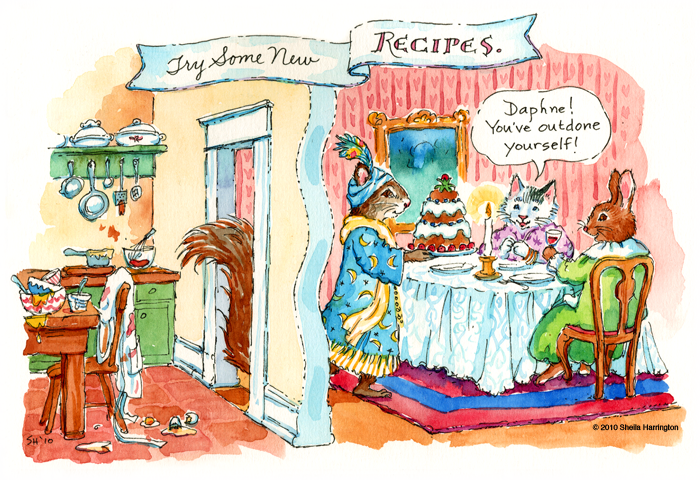 I recall my mother and her best friend watching reruns of The French Chef and using their families as guinea pigs for meals drawn from Mastering the Art of French Cooking. For which we were not entirely grateful at the time—children being creatures of habit—but which inevitably expanded and uplifted our tastes. Happy Birthday Julia, and merci mille fois. Today is also the Feast of the Assumption, one of the the many holy days which the French honor in sacred traditional fashion: that is, taking off from work and heading out of town for some R&R (if they are not already there, it being, after all, the month of August). For a comic, please see Assumption. 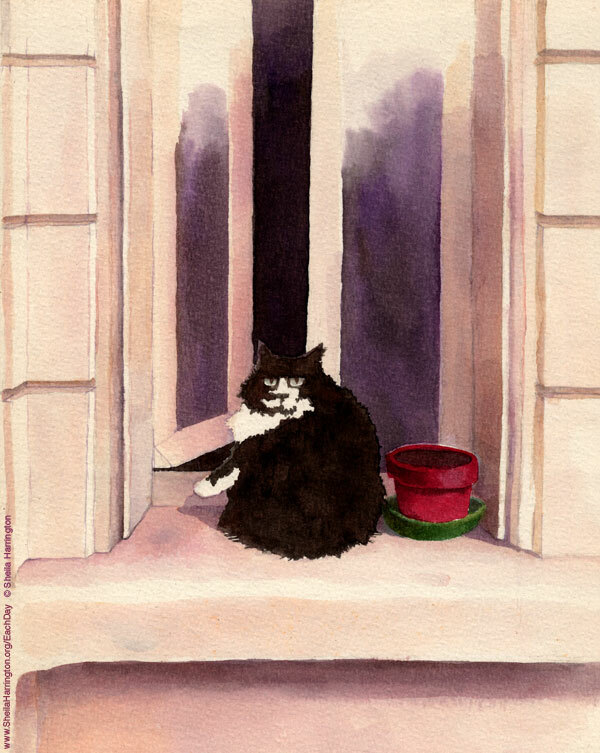 This rather fierce-looking cat is Minou, the spoiled darling of the concierge, painted in our long-ago Paris days. Minou is undoubtedly long gone, but she pretty much ruled the roost while she was around. I post her portrait here, along with this poem, in honor of Eleanor Farjeon (1881-1965), whose birthday it is today. 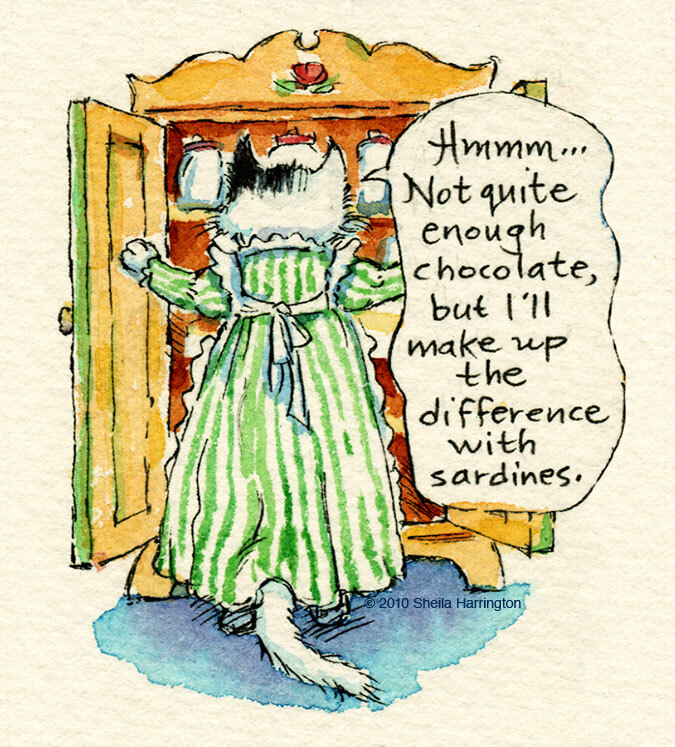 For a brief bio of the delightful Farjeon, another of her poems, and a painting, please see Morning Has Broken. —Antoine de Saint-Exupéry, whose birthday it is today. And it may be much-welcome advice for those struggling to get out of town. Longing to expand his perspective, Linnaeus applied for and received a grant for a field expedition to Lapland, a rugged region above the Arctic Circle, where he expected to find many unrecorded species. Linnaeus spent five months exploring and studying rocks, plants, insects, animals, and people, and returned with thousands of specimens (no people though), filled with excitement. He returned to lecturing, and planned a series of books cataloguing species according to his new system. Linnaeus DID actually long for a reproductive life of his own. He paid court to a young lady whose father, not taking a wandering botanist very seriously, insisted that Linnaeus wait three years and meanwhile establish some means of supporting a family. So Linnaeus went off to Holland, whose universities were better equipped than those of Sweden, to complete his medical degree. He also found work there managing and classifying the contents of Dutch zoological and botanical gardens. THEN, in 1735, while still in Holland, he published his book Systema Naturae, which explained his concept of classification. 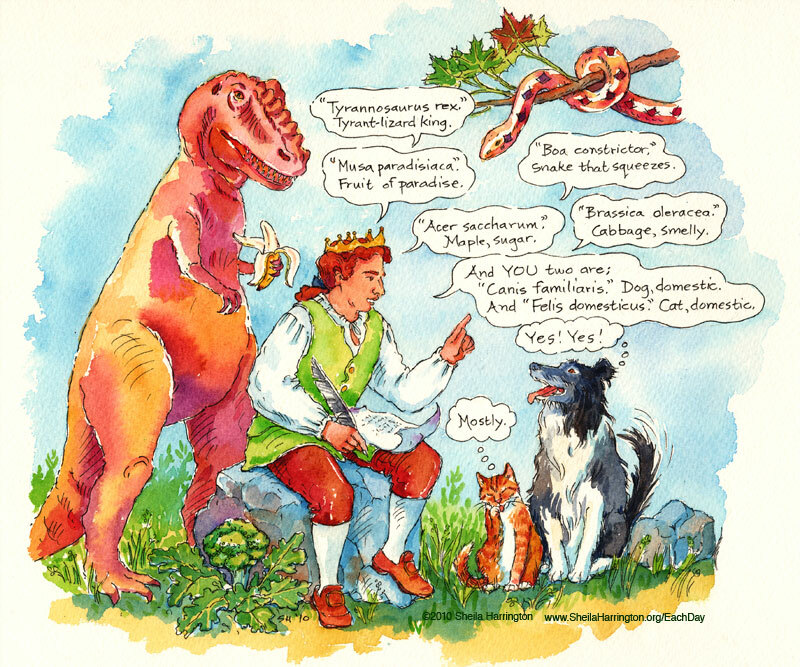 Linnaeus grouped plants and animals into genera—groups whose members have something in common, usually structural or related to reproduction. (Linnaeus was the first to classify whales as mammals.) Then he subdivided each group into species. (His complete heirarchy, as you may recall from high school, is Kingdom, Class, Order, Genus, and Species.) And then he gave each member a two-part name based on these divisions, replacing all previously-used cumbersome lengthy descriptions. These two-part names were in Latin, which was, and still is, the universal language of science. I told you those Latin classes would come in handy. Systema Naturae hit the botanical world like a bolt of lightning. The notion that PLANTS (seemingly so innocent!) had a Sexual Life, by which Linnaeus partly categorized them, was outrageous and horrifying to some naturalists, and Linnaeus was criticized for “nomenclatural wantonness.” But, despite objections on both theological and moral grounds, Linnaeus’ achievement launched him from obscurity to fame. A binomial concept had been proposed by Swiss botanist Gaspard Bauhin in 1623 but was never widely used. When Linnaeus combined it with his new categorization methods, the idea spread rapidly. Here was a practical tool: reasonable, memorable, universally applicable. Not only could scientists from different countries know they were communicating about the same species; it was even easy for amateurs to use, and it sparked a more widespread interest in natural history. Such is the effect of nomenclatural wantonness. Now back in Sweden as an established botany professor, Linnaeus was able to marry his fiancée, although he spent so much time away on expeditions that she might have been happier with one of her other suitors. He lectured, wrote many works on botany, corresponded with other naturalists, revised and expanded Systema Naturae many times throughout his life (it eventually reached 2,300 pages), led collecting expeditions, and inspired his students to travel throughout the world as botanical and zoological explorers. One circumnavigated the world with Captain Cook. Others went to North America, Japan, China, and Southeast Asia, returning with specimens (or occasionally dying in a distant land; collecting could be dangerous work). Eventually he was knighted for his contributions to science and became Carl von Linné. So there, Mom and Dad. Linnaeus himself gave scientific names to 4,200 animals and 7,700 plants, generally choosing names to reflect physical qualities, but occasionally to honor a friend or colleague, or, with a particularly ugly or toxic specimen, to insult someone who had annoyed him. Be wary of affronting a botanist. They are still lurking out there today…naming species. With some modifications due to our modern understanding of evolution, Linnaeus’ system is still in use today, and pretty much taken for granted. But whenever you say Homo sapiens, or Boa constrictor, perhaps now you will think of Carolus Linnaeus, who made it possible, and you will celebrate his birthday every May 23rd. If you weren’t doing so already. Throughout his life Linnaeus was a deeply religious fellow. He saw his work as clarifying for the world the underlying connections among living things and confirming the intelligence of a great Creator. Ironically, however, because his work made possible far greater understanding and communication among naturalists everywhere, it led to observations of surprising patterns and eventually to the shocking speculation by Charles Darwin and Alfred Russell Wallace that species, instead of having been from their Day of Creation exactly as we know them now, had perhaps changed over time. Over a long, long time. We do not know the ultimate consequences of our life’s work. Some of my work is available as 5" x 7" cards. 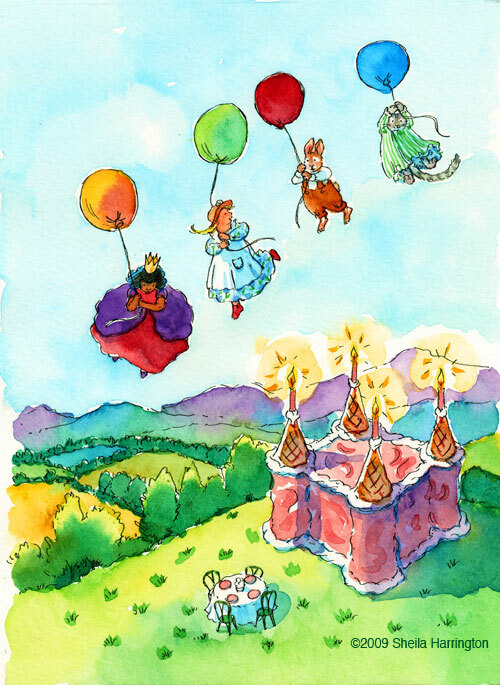 Please see the Cards page of my website. Some of the images on this blog are now available as 8.5" x 11" archival high-resolution prints. Look for the "Add to Cart" button or email me about specific images.